The Counter Balanced Motion (CBM) Seat is an optimized comfort control mechanism with crash safety and cost saving advantages. The main feature of this unique device is the arcuate path of motion and a spherical motion component of the seat that provides comfort adjustment and also acts as a safety restraint. For comfort, the CBM Seat passively supports posture change. The movable backrest and lumbar offer continuous back support while driving. The CBM Seat automatically balances seat tilt and lumbar angle with optimal weight distribution, thus reducing driving fatigue. The seat, backrest, headrest and lumbar adjust to the posture and movements of the occupant without hand-activated adjustment. For frontal crash safety, the CBM Seat utilizes the seat and lumbar cushions as a passive crash safety restraint. It automatically increases seat containment angle to stop the occupant, redistributing forces and improving crash dynamics. The CBM Seat also actuates a backrest and headrest mechanism that increases rear crash safety. In a typical frontal impact, the occupant continues forward and is restrained by the belt and airbag, with virtually no safety contribution from the seat. The traditional seat in Figure 1, is compared to the CBM Seat 50 milliseconds into a crash simulation. The traditional seat shows visible space between the lowerbackrest and the driver’s back. The body is sliding forward and escaping the seat. With the CBM Seat, effective deceleration has already begun. The driver’s lower back is still in contactwith the lumbar support to control rebound and, more importantly, the face is not yet in contact with the airbag. In the crash simulation stills above, the angles the seat pan and bottom cushion make with the horizontal plane are notably different. 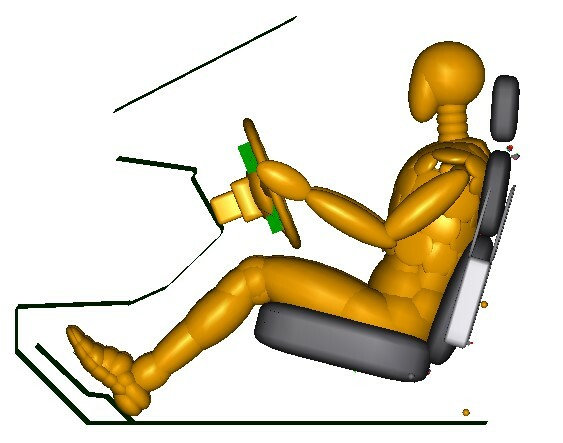 The body is kept in contact with the seat and begins to dissipate upper and lower body impact forces instantaneously, even before the seat belt or airbag can act. This occurs because the CBM Seatutilizes an arcuate path located proximate to the occupant’s center of gravity. The CBM Seat is an occupant restraint. It complements with the combined use with belts and or airbag (SRS) and also unbelted to improve safety performance above fixed seats. 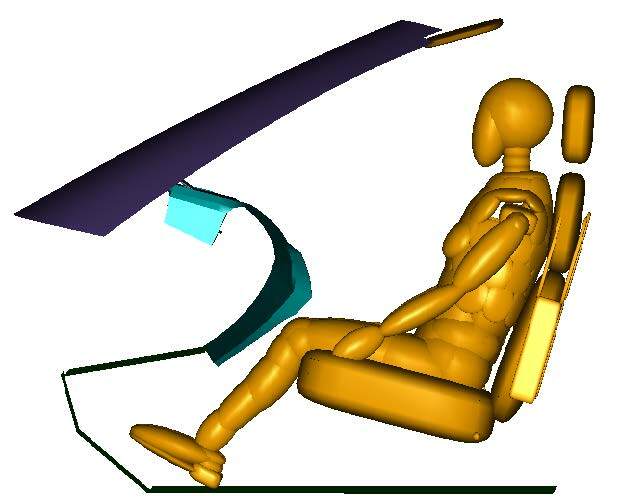 Crash simulation of the CBM Seat utilizing a softer airbag and softer belts, yield a reduction in injury loads. All tests have shown that the CBM Seat effectively prevents submarine of the lower body. These advantages are also seen in 25mph, unbelted frontal as well as 35mph offset-frontal impact simulations. NHTSA’s Full-Frontal Impact Star Rating, shown in Figure 2, is based on the combined probability of head and chest injuries for an average adult male. CBM technology alters occupant motion during a crash, reducing key accelerations and lowering the probability of these injuries. Chest deflection is optimized to achieve NCAP 5 star rate. All the responses are below 60% of FMVSS limits. Chest deflection is optimized to achieve NCAP 5 star rating. All the responses are below 50% of FMVSS limits. Chest deflection of 20.2mm is observed, 2. Very low 1.4kN Femur load is observed. All the responses are below 50% of FMVSS limits. Low Chest deflection of 6mm is observed, with very low 1.6kN Femur load. Critical responses such as chest deflection, HIC and NIJ are reduced which helped achieving 5 star ratings for both driver and passenger. 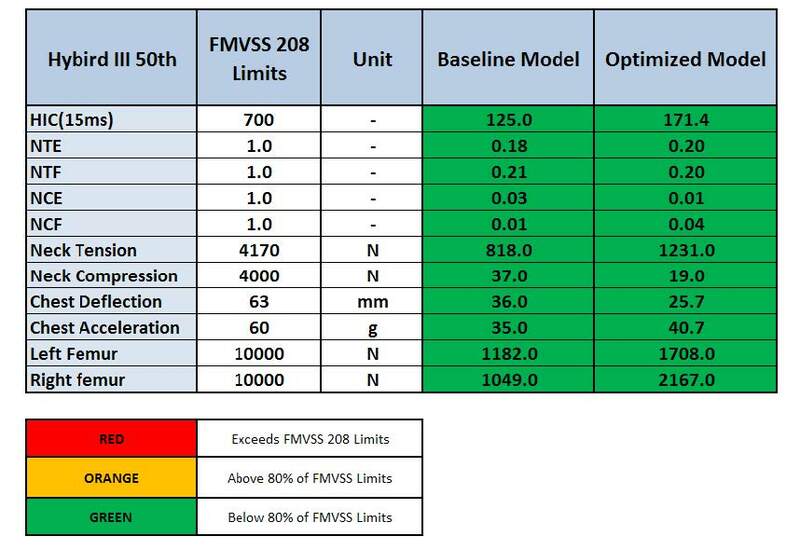 25mph unbelted 5th and 50th show performances below 45% of FMVSS208 limits. The trend analysis shows the chest deflection, HIC and NIJ and can be further reduced with some optimizations to the restraint system. In rear impacts, the CBM motion is reversed. The headrest moves up and forward to restrain the head sooner. 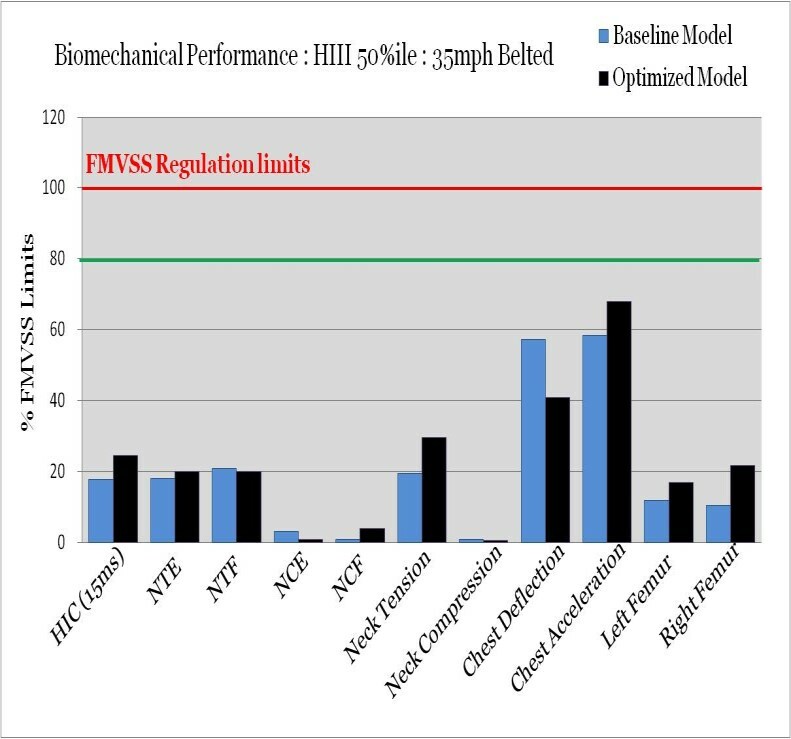 HIC values are over 50% lower with the CBM. Neck and NIJ load levels are well below 1 (0.5- 15% of maximum). In general, other differences are large but not of significant magnitude.